BACK TO FULL LIST Check back to CNN.com as we add more heroes profiles in the coming weeks and watch CNN TV on September 11, 2002 for video profiles of these and all the CNN Heroes of 9/11. 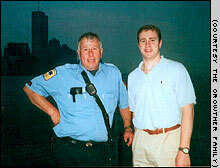 Story: An equities trader on the South Tower's 104th floor, Crowther helped dozens of people to safety on September 11. His body was found in March 2002, alongside several firefighters and emergency workers bunched in a suspected command post in the South Tower lobby. In their words: "I see this incredible hero, running back and forth and saving the day... People can live 100 years and not have the compassion, the wherewithal to do what he did." NEW YORK (CNN) -- They sat bloody and petrified -- the lights out, smoke engulfing the room and pain searing through their bodies. There was no escape from where they were in the South Tower, in pieces after being hit by United Airlines Flight 175 as far as they could tell. Then out of nowhere, a young man burst in and took control. In a strong, authoritative voice, he directed them to the stairway -- which was veiled by darkness, wreckage and haze -- telling the injured to get out and the healthy to help them down. "I see this incredible hero, running back and forth and saving the day," recalled Judy Wein. "In his mind, he had a duty to do -- to save people." "He's definitely my guardian angel -- no ifs, ands or buts -- because without him, we would be sitting there, waiting [until] the building came down," echoes Ling Young. Wein and Young were separated by a few minutes and a few floors that day, but they share a similar story and a single hero: Welles Crowther. Both women credit the equities trader and volunteer firefighter with saving their lives and dozens of others on September 11. But until a few months ago, Crowther was just an unforgettable face to Young. Wein remembered his penetrating eyes, firm voice and the red bandana he wore over his nose and mouth that late summer day -- but didn't know his name. That changed late last May, when a New York Times article featuring a description of the man in the tell-tale bandanna led Welles' mother, Allison, to Wein and then to Young. "Everything we shared -- all the details -- led right to Welles, so it was really beautiful," Allison Crowther said from her Upper Nyack, New York, home. "I am just so proud and gratified that he had the strength of character, the courage, the sense of duty to help others." 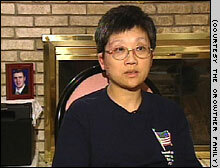 Ling Young, who was saved by Welles Crowther on September 11, keeps a picture of Crowther in her home. Welles Remy Crowther was born the oldest of three children, displaying his fearlessness, spirit and selflessness early and often growing up in the New York's northern suburbs, his parents say. He doted on his two younger sisters and followed his father Jefferson's lead, always carrying a bandanna in his back pocket (Welles preferred red, his father blue) and joining him as a volunteer firefighter as a teenager. A star student and lacrosse player at Boston College, Crowther joined Sandler O'Neil and Partners after graduation, settling into his office on the South Tower's 104th floor. While he loved his job, Welles told his dad that he really wanted to join the FDNY -- or possibly the CIA or FBI -- so he wouldn't be stuck behind a desk and would be able to help others. But that's where he was, behind his desk, on the morning of September 11. He made one final call to Allison from his office at 9:12 a.m., minutes after his tower was struck, leaving a brief, calm message saying, "Mom, this is Welles. I want you to know that I'm OK."
That call was all the Crowthers knew about their son's final moments until police knocked on their door last March. Allison said the New York medical examiner's office told them Welles' body had been found intact, with no signs of burns, alongside firefighters and emergency workers then running a command center in the South Tower's lobby. Authorities speculated, according to Allison, that Welles was aiding the rescue effort as a civilian usher when he died, suddenly and painlessly, when the building fell. An official from the medical examiner's office told CNN the office does not release information on the condition and whereabouts of Trade Center victims, adding that relatives are welcome to share such details with the media. "We took great peace in knowing that [Welles] didn't suffer and that, up until the end, he was being very courageous, doing what he wanted to do," said Allison. "So he must have felt very fulfilled that day, knowing he was helping others." Judy Wein was working for the insurance firm AON Corp. right below Welles, on the 103rd floor, when American Airlines Flight 11 hit the adjacent North Tower. Ignoring an announcement telling her building's occupants to stay put, she began heading downstairs. Ling Young, in her 86th floor office of New York's Department of Taxation and Finance, took an elevator to the 78th floor sky lobby. She was waiting there to board an express elevator to the street when the United jet tore through the floor, sending a rush of flames and debris that knocked her to the ground. When she got up and cleared the blood -- her blood -- from her glasses, Young saw "nobody -- almost everyone was dead." She and a few survivors huddled, waiting for help. After several grueling minutes, Welles popped onto the floor and made his remarks. Badly burned, Young and her fellow survivors obediently followed Welles, who was carrying a young black woman on his back. He dropped off the woman some 15 floors later and headed back upstairs, according to Young, saying that more people needed assistance. When he returned the 78th floor, Wein was waiting in pain, the impact having broken her arm, cracked her ribs and punctured a lung. Welles, now wearing his favorite red bandanna over his nose and mouth, burst into the room and, as he had with Young's group, loudly and calmly directed people to the stairs. This time, Welles went his own way as Wein headed down. "If he hadn't come back, I wouldn't have made it," said Wein. "People can live 100 years and not have the compassion, the wherewithal to do what he did." 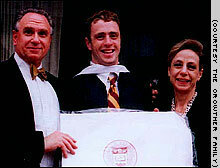 Jefferson and Allison Crowther flank their son Welles after his graduation from Boston College in spring 2000. Earlier this summer, the Crowthers met with Judy Wein and Ling Young, two of the women their son saved from the South Tower of the World Trade Center. As fall rolled into winter and 2002 began, the two women still couldn't get the image out of their heads. Wein said she'd go on the Internet and cover up the noses and mouths of those in the towers, hoping to identify the man in the red bandana. Young said Welles' face would pop into her head several times a day, because "he is the one who actually saved me from the start." The pieces all came together late last spring. Allison talked with Wein on the phone, then met with Young days later. One early summer Sunday, both women and their families went to the Crowthers' house for a picnic. While they're recovering from their physical injuries, both say the pure, powerful connection with the Crowthers has expedited their psychological recovery. "It does help me put myself in a lot more peaceful mind than I used to be, especially now meeting his family, who are like our extended family," said Young. "It really helped me tremendously, and helped me heal a little bit more, at least mentally." For the Crowthers, the details of Welles' final minutes reaffirmed their belief in his kindness and courage. And they are committed to making sure his life, and death, were not in vain. Jeff Crowther hopes his son's story will inspire people to become a volunteer firefighter, to give money to the homeless every day like Welles did, to set goals and follow through. "If Welles' story helps people to think of others then God bless them, God bless him," said his father. "He didn't live long enough to be head of a corporation or do good works or endow a museum. But what he did on September 11, that's his legacy." -- CNN correspondents Greg Botelho and Maria Hinojosa contributed to this report.